We could hear the thunder before we even left the car. Once out, we felt the mist, even blocks away. The air smelled of sunshine and flowers. We knew we were in for an exciting day! This one was going to be special, something both of us had never experienced and were excited to see it together. 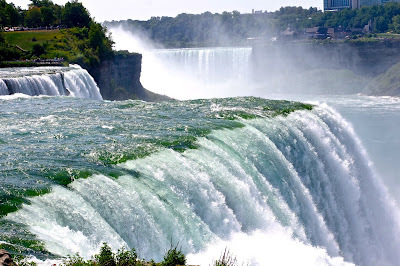 Niagara Falls NY, just saying the name brought goosebumps. Seeing pictures, reading about it, hearing about it, builds it huge in your mind creating expectations that few landmarks can really live up to. So, were we in for a disappointment? Full of anticipation and apprehension, we couldn't help but walk fast to the nearest view point. We just stood there in awe, trying to take it all in. Can one, really? It seemed like minutes before either of us could utter a word. It was magnificent, completely staggering in it's power and beauty. All that came out of my mouth was "wow", I was stunned. How could it be even more beautiful, more compelling than everything we had expected? Slowly we moved from one view point to another, still trying to take it all in. We observed groups of people in yellow ponchos in a Que, close to one area of the falls, and another in blue ponchos boarding a boat. We looked at each other and both of us said "lets do it all!" We knew we wanted to experience this majestic landmark in every way we possible. First up was the Cave of the Winds. 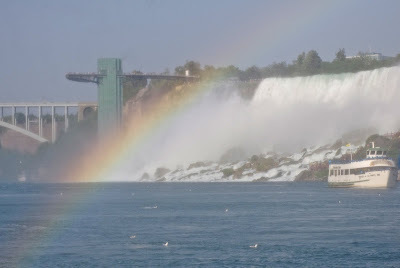 It explores beneath the American Falls via the Hurricane Deck. We both giggled at the expectancy of getting that close and getting soaked while we were at it! Along with the "stylish" yellow ponchos, they also give you equally "stylish" foam-rubber sandals, putting your regular shoes in a plastic (carry with you) bag. 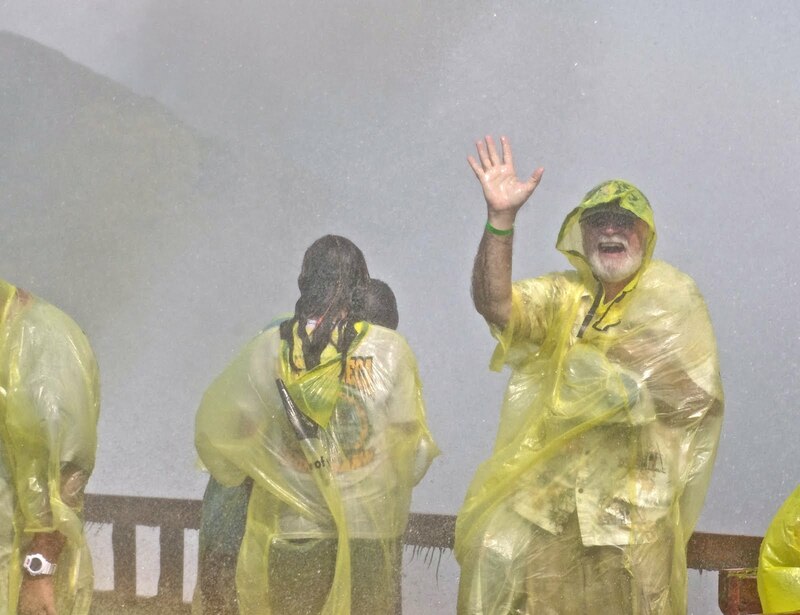 As you Que up you can hear all the laughter from the participants before you mingling with the incredible thunder of the falls. Soon, it was our turn, our laughter joined in with the others. It was like walking into a huge, powerful shower, spraying in every direction with a force that was undeniable. Jack, getting into the true spirit of the experience, ventured right up to and into the falls! I just kept sneaking my camera out from under the poncho to take pictures as quickly as I could, without soaking my camera in the process. Once we had accomplished our goal, we stumbled into the inescapable souvenir store, shedding our ponchos as we walked. Only partially wet, we decided to keep the new "shoes" on for our next quest. On to the blue ponchos! 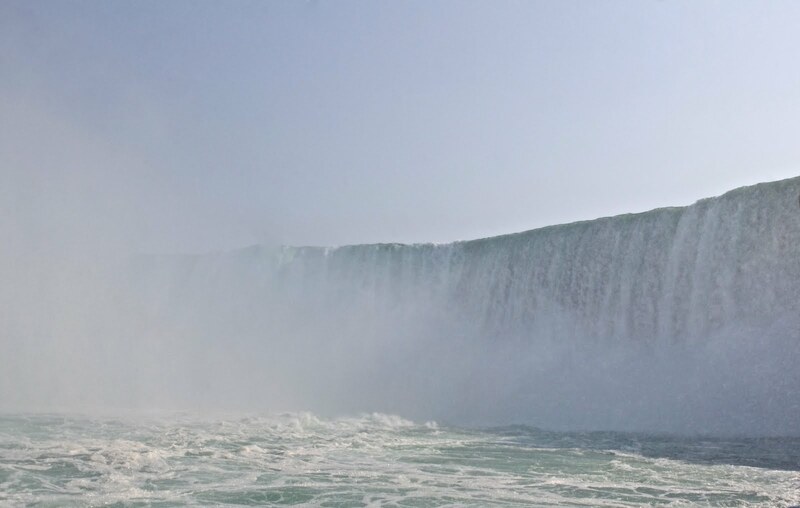 The Maid of the Mist has promised travelers since 1846, that they will take you "right up to the falls". The boat trip encompasses both the Horseshoe Falls and the American Falls. Once again the onslaught of fresh, cold, clean water hits you from every direction. Tucked in beside a couple of larger people, I managed to safely bring my camera out and quickly snap as many pictures as I could, all the while in wonder of this amazing experience. 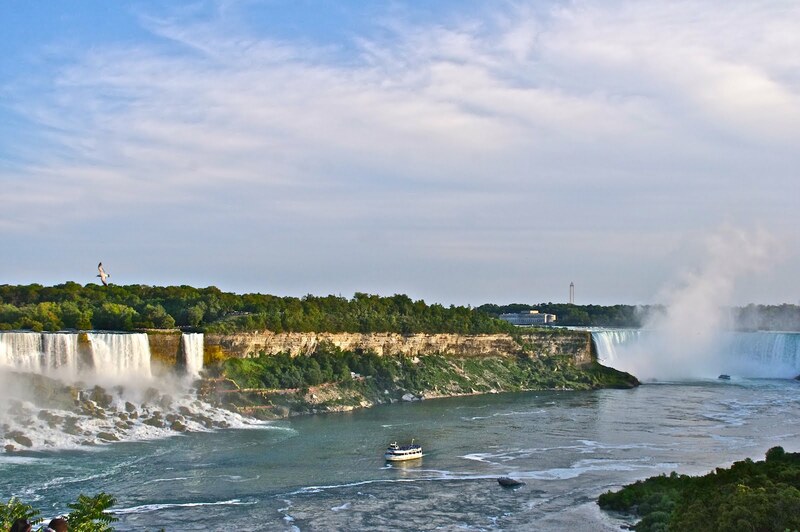 After the boat trip, you are welcome to go up to the Observation Tower for a fantastic view of both falls and the Gorge. 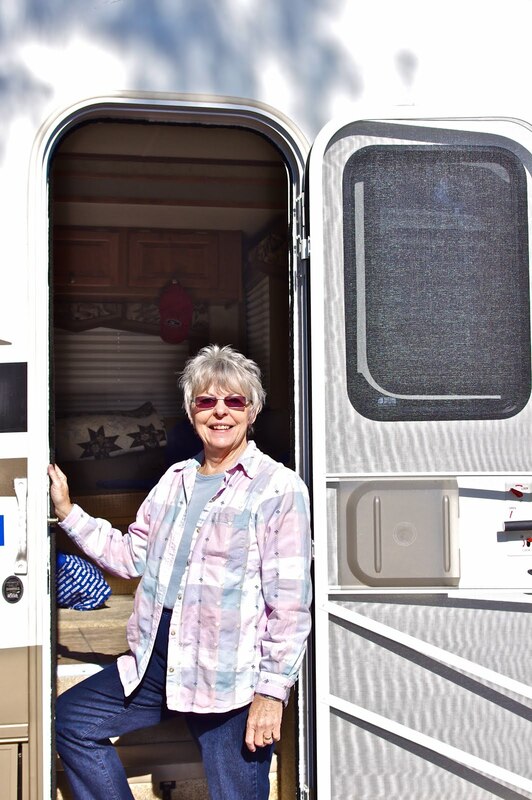 Exhilarated and breathless, it was time to take a rest and have a bite to eat. What better place than at the Top of the Falls Restaurant? Shoes changed, clothes dried out a bit, we proceeded to the restaurant and a great window view of our recent experience. After our short respite we spent most of the rest of our day traversing up & down the Gorge, taking in as much as we could, for tomorrow would be the Canadian side! No one prepared us for what we saw, minutes after crossing the border. As we traversed the convoluted route toward the falls and parking, we were treated to an onslaught of "entertainment". Garish protruding facades reached out to grab you and bring you into their attractions. 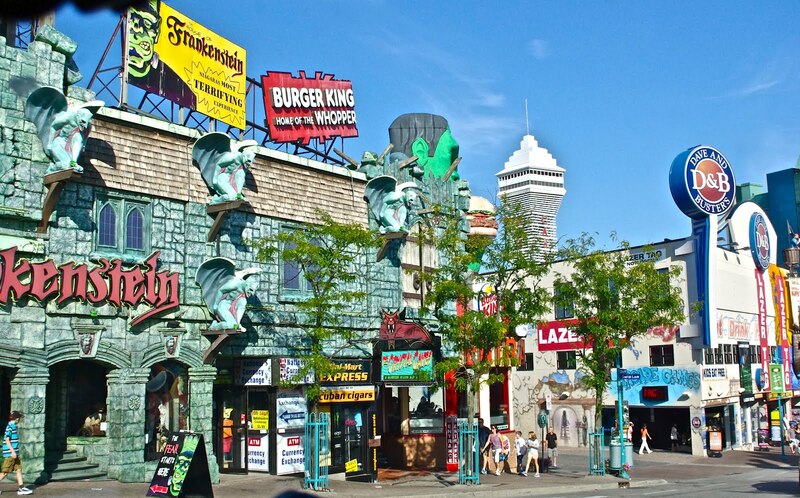 Clifton Hill blares out at you from every angle offering everything from growling dinosaurs at the mini-golf adventure to a giant Ferris wheel. Bars, restaurants, shops, all shout out their promises for a "good time". We soon discovered that parking was at a premium, charging anywhere from $15 to $45. 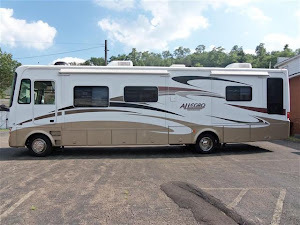 After about our third go-around we were lucky to find a $15 spot not to far from the falls. 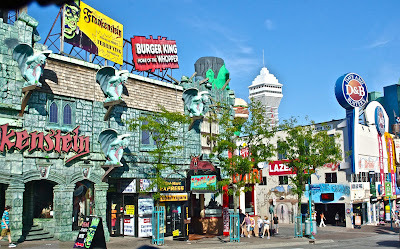 Arriving, surviving the onslaught on Clifton Hill, we were in for quite a different experience. Crowds of people (not so much on the NY side) pushing strollers, walking hand-in-hand, taking pictures and just sitting and enjoying the view, were everywhere. It is true that on the Canadian side you can get a full-on view of both falls, but what they don't tell you is that the view is at a further distance. 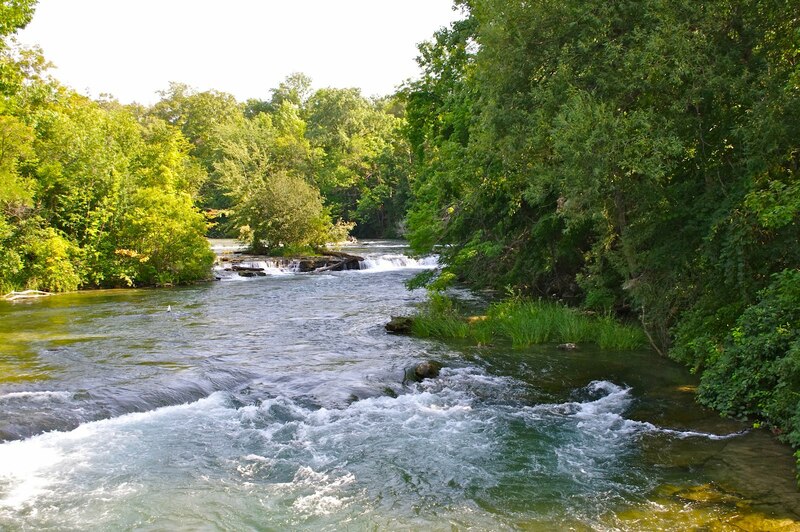 It's beauty still majestic; we walked all along the viewing area. 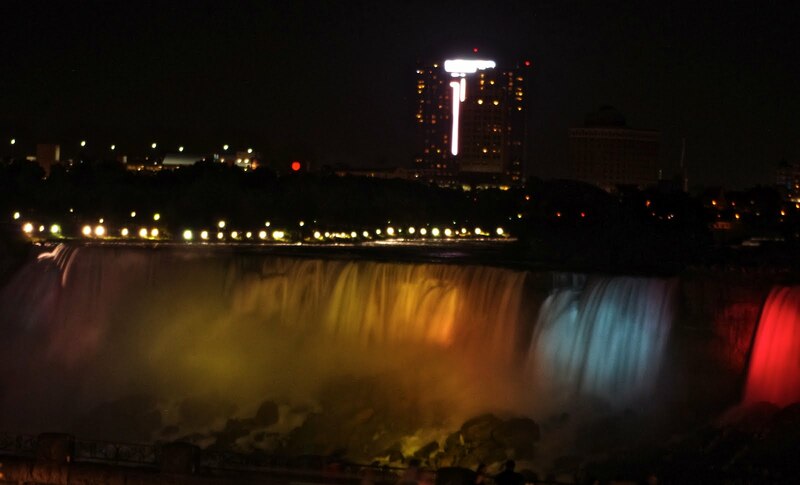 Today was our wedding anniversary and we wanted to view the falls at night when they "turned on the lights". There were several restaurants that offered prime viewing, at prime prices. We decided on the Edgewaters Restaurant, not the most fancy, but the closest to the falls. We were successful in timing it just right. Just as dinner was being served at our great window seat, the lights came on. First, all white for both sets of falls, then slowly changing into rainbows of color. Each change more beautiful than the last. The show would go on for hours. Satisfied from dinner and the beautiful view, we headed back across the border. Thunder, we decided was the sound of water cascading over the boulders in the US and the noise of the attractions on the Canadian side. One more reason to add to our list of why we love America the best.